Everybody needs to roar like a lion once in a while! Did you know that despite all of their roaring and growling lions are very social animals and live in groups called prides? They also sleep or rest for 16 to 20 hours a day! 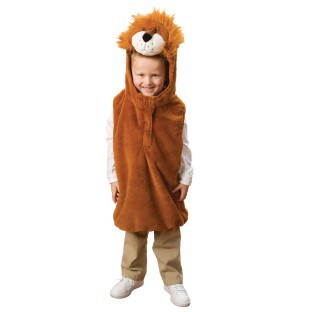 The softness of the fabric in this costume will have little lions eager to put it on and socialize for dramatic play. Lined hood and finished arm holes ensure there are no rough edges! Easy on and off features hook and loop closure placket in front of costume with ample opening and fully elasticized bottom. Machine wash and dry. For ages 3 to 6 years.